Drought holds the potential to catastrophically impact agriculture and food supplies, yet current policies for preventing and mitigating drought leave many concerns unsettled. 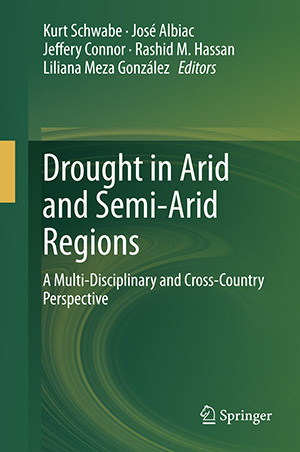 A new book; Drought in Arid and Semi-Arid Regions: A Multidisciplinary and Cross-Country Perspective (Springer, 2013) addresses the environmental, social, political, and economic impacts of drought from a variety of perspectives. Kurt Schwabe, an Environmental Economics and Policy professor at the University of California Riverside and director of the Water Science and Policy Center in California edited the book. Seedstock had a chance to talk with Schwabe about the new book, as well as how drought impacts sustainable agriculture. SEEDSTOCK: Why did you choose the topic of drought for this book? Schwabe: Drought is a recurring event that can impose significant damage on society, and that damage will likely increase in the future, with increased water scarcity expected due to rising demands from population growth, and less reliable supplies due to climate change, especially in semi-arid and arid environments. Interestingly, the most costly natural disaster in U.S. history was the drought that the Midwest experienced in the late nineteen eighties. The book itself is the byproduct of a symposium that the Water Science and Policy Center at the University of California Riverside held in 2009, which was timely, given the severe drought much of the US and Australia was experiencing. 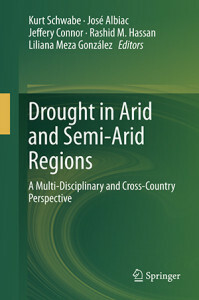 The motivation behind the symposium and book was partly due to the observation that there’s a significant amount of knowledge on the impacts of drought as well as the success of different strategies to mitigate such impacts, but this knowledge was spread across different countries, agencies, and scientists. We wanted to provide a platform for the exchange of this information so that we might better understand the short and long run implications of drought on ecosystems, agriculture and urban systems and thus be better equipped and motivated to deal with it. SEEDSTOCK: How does drought impact agriculture and how does it impact other aspects of life? Schwabe: Good question. Since drought is often a regional phenomenon at any particular point in time, the regional agricultural community can be impacted by drought quite severely. Of course, the magnitude of the impacts on agriculture will depend on the level of water scarcity within the system, which includes the amount of water stored for such events relative to the demand on this water. The magnitude will also be impacted by both the vulnerability and flexibility at the farm and institutional level to deal with drought. For instance, those growers with perennial crops could suffer significant damages over many years if they lose their plants. Beyond agriculture, the findings from more recent research suggest that the most significant impacts of drought are on energy production and recreation. Energy requires significant amounts of water for cooling purposes as well as for direct production in hydroelectric power plants. And drought can significantly impact the environment by reducing the quantity and quality of water critical to flora and fauna. SEEDSTOCK: Why is it important that this book be written now? Schwabe: Drought events in semi-arid and arid regions have recently been predicted to become both more frequent and severe in the region. Without a proper understanding of drought and the effectiveness of various strategies to mitigate its effects, decision makers ranging from growers to governmental agency personnel are placed in a difficult position – to make both short and long run decisions without very good information. SEEDSTOCK: Who is your intended audience for this book? Schwabe: Given the diversity of chapter authors, ranging from irrigation specialists, agronomists, and hydrologists to ecologist, economists, water managers and policy makers, the intended audience is broad. I believe academics, government agencies, practitioners, and anyone interested in drought will find this book interesting in one way or another. SEEDSTOCK: In your opinion, what are some of the most promising solutions proposed in the book? Schwabe: The most cost-effective solutions will depend on a number of factors, including what’s already been done in terms of drought-proofing a particular region. In regions where low-cost storage options have not been investigated or adopted, for example in South Africa, and possibly northern California, such options may provide substantial returns in mitigating drought. In other regions where storage is not an environmentally friendly or low-cost option, there often remain significant opportunities to reduce vulnerabilities through water conservation, water reuse, and institutional change. Water markets that are cognizant of third-party effects are a very effective strategy for lowering the costs of drought, as are groundwater banks. Cooperation within watersheds, as well as across regions, can also provide significant cost-lower opportunities to mitigate drought.